Hayley Lewis interviews Betty Wiseman. 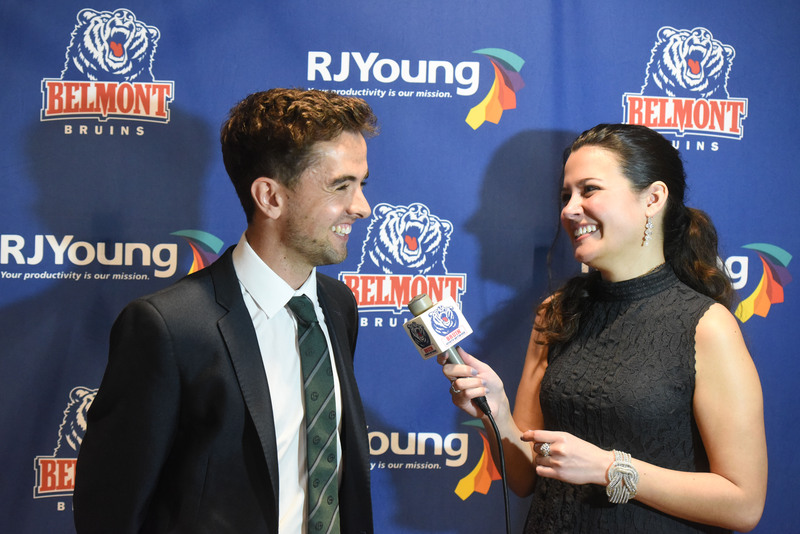 Despite being the springboard for these and many other students’ careers, the Belmont Athletics broadcasting internship is fairly new. According to Greg Sage, the assistant athletic director for broadcasting & media relations, “The genesis of this [program] was me trying to find ways to elevate the production quality of our OVC Digital Network video streams. We had a number of talented students with on-air aspirations who were looking to gain experience in live television production and strengthen their resume reels,” so the department created that opportunity for them. Other alums finding success in this field include 2016 journalism grad and former women’s soccer player Emily Proud, who is now a sports anchor/reporter for WATE-TV Knoxville, and Grace Chapin, a morning news reporter with KHQ in Spokane, Washington who received a bachelor’s in video production and a master’s in sports administration from Belmont in 2015 and 2017 respectively. Unsurprisingly, the program has gained attention across the campus and is continuing to grow. Currently, Belmont Athletics has added several more students to its broadcasting line up, including Belmont women’s basketball player Paris Lawson, Belmont Vision sports editor Shelby Vandenbergh and even Lindsey Nance, a student at Lipscomb University.